Professor Andy Hoskins challenges campers to experiment, fail, learn, and repeat in the spaghetti tower competition. Why is it important that we continue to increase STEM graduates? As President Barack Obama said, “[STEM] is more than a school subject. It is an approach to the world, a critical way to understand and explore and engage with the world, and then have the capacity to change the world.” The 2014 census shows that although not all STEM majors find careers directly related to their major, those with STEM degrees have a greater likelihood of a finding a job than their peers in non-STEM majors. So how do you inspire youth to pursue a career in a STEM-related field and set them on the right course at an early age? What skills and/or lessons can be passed onto high school students in a week’s time? How can we raise their awareness of the impact we can have on the world without leaving central Pennsylvania? These questions were addressed in a science camp run this past summer at the Materials Research Institute (MRI) titled “Make It Matter.” This camp was developed by Max Wetherington, MCL staff scientist, and run as a part of the Science-U program, directed by Jessica Kim-Schmidt. The camp was a guided interactive journey of the materials engineering research process from initial concept to implementation. Each day of the camp highlighted one main theme of this process: motivation, design, fabrication, development, and implementation. The case study for this camp was the design and development of functionalized nanowires as a cheap and versatile gas sensing device -- a research project managed by Oren Gall, research associate in the School of Electrical Engineering and Computer Science. The case study highlighted the challenges, questions, and potential solutions at each step in the process. In tandem with the case study, the campers worked in teams to develop their own theoretical solution to a problem that matters to them. This ownership of a problem allowed them to tie the lessons from the day’s activities directly to their group project. A range of activities was spread throughout the week, including live demonstrations, games, group discussions, lectures, and team projects. Within MRI, students witnessed the engineered controls in the sub-fab necessary to ensure safety in the Nanofabrication facility, examined crystal nucleation in real-time, and observed some of the world-class characterization capabilities in action (including a high resolution TEM). Campers had the opportunity to interact with one research project nearly ready for commercialization (Stephanie Velegol’s Moringa seed water purification project) and three Penn State start-up companies (Croptix, L4IS, & Nanowear) that scaled the technology readiness levels. 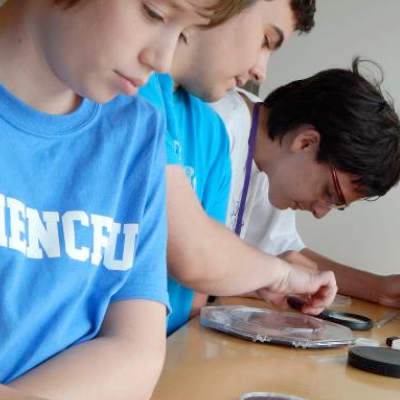 At multiple stages in the research engineering process, campers were challenged by different games that required them to apply the skills they had just learned. And throughout the week teams developed life-cycle assessments for their inventions, learned keys to overcoming seemingly impossible problems, and even had a chance to pitch their ideas to a panel of judges at the end of the week that included faculty, staff and students from prior camps. The Make it Matter camp provided an amazing opportunity for these kids to explore STEM careers, and understand how STEM can solve big problems in the world. Did it answer our initial questions and make a difference in a single week? Maybe. A total of 12 out of the 16 campers reported that this camp increased their interest in studying STEM in college and going into a STEM career.